There aren't enough superlatives in our language to describe just how comforting these meltingly tender, deeply caramelized, flavour packed sweet potatoes are.The uncomplicated, high-temperature cooking method condenses both the sweet and savoury qualities of sweet potatoes. Adapted from and with thanks to Spicy Southern Kitchen. Peel the sweet potatoes and cut into 1-inch thick rounds. Arrange on a half sheet pan with space between the slices to allow for air to circulate. Drizzle the potatoes with the butter or coconut oil and the garlic extra virgin olive oil or plain extra virgin olive oil. Sprinkle the salt and pepper over the top. Use your hands to flip the sweet potatoes and slide them around in the oils, making sure they're completely coated. 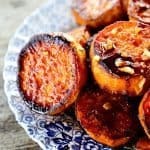 Roast the sweet potatoes for 15 minutes, or until the undersides of the slices have caramelized to a beautiful deep brown. Carefully flip the sweet potato slices and return the pan to the oven for another 15 minutes. Flip the sweet potato slices once again and scatter the chopped or sliced garlic over the sweet potato slices and then pour the vegetable broth over the works. Return the pan to the oven for another 15 minutes, or until the potatoes are completely tender and the broth has reduced to a thicker consistency. Use a spatula to transfer the Melting Sweet Potatoes to a serving plate and drizzle the sauce from the pan over them.